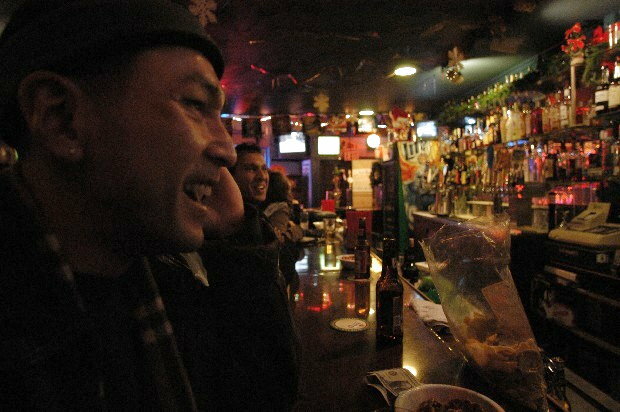 Ron Hideshima sits at Judi's Place on Market drinking his Ouzo. He just got off work and is talking to a friend about a trip he is making to Boston tomorrow. Ron is going to speak at Harvard and MIT about a piece of hardware called the DOTVIEW that makes it possible for sightless persons to access email, do web research, learn Japanese and "see" Windows icons through the help of over 1,500 Braille pins that move in and out of the DOTVIEW forming the equivalent of a Braille computer screen. Ron lost his own sight in a car accident when he was 25, and immediately taught himself Braille.